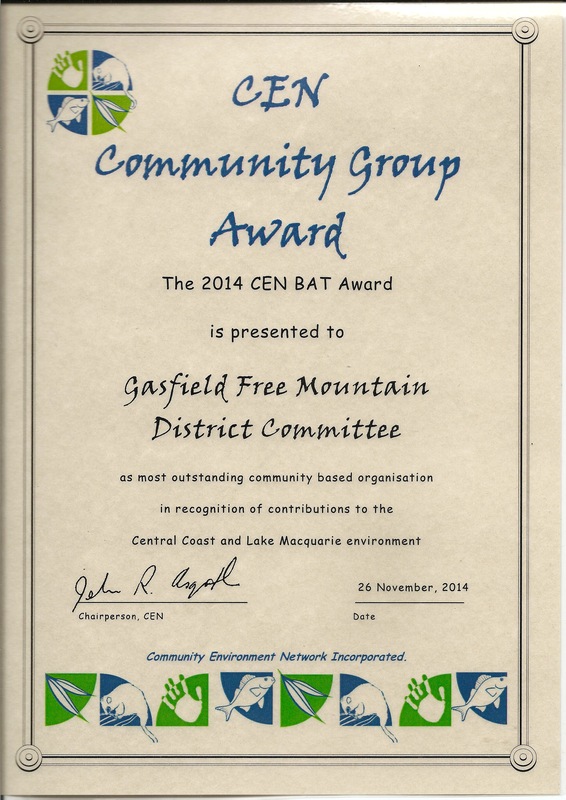 Gasfield Free Mountain Districts campaign wins CEN “Best Community Organisation” award. All the efforts of everyone involved in the road survey effort, the community meetings and everything else we’ve achieved thus far has been given the nod of approval and appreciation by the Coast Environment Network. Gasfield Free Mountain Districts Co-Convenor Simon Perry gratefully accepted the award on behalf of the group at the CEN BAT (Being A Team) awards night on Wednesday the 26th of November. The award included a $200.00 cheque which has been added to the group’s “fighting fund” that is slowly building in anticipation of costs associated with the commissioning of permanent roadside signs, and also the holding of the community Gasfield Free Declaration (February 28th 2015). A blustery morning did not deter visitors to our local market on Sunday 29th June. Under sunny skies Anti-CSG Committee members Poppe, Sue and Lorraine greeted the community at the Mountain Districts Association’s Gasfield Free stall in shifts throughout the day. We signed up more helpers to assist us with our surveys of the local district and were also happy to receive some donations from generous locals and visitors alike (thank you!). We had numerous requests from people wanting to “sign petitions.” However, we told them that our strategy of surveying landholders and residents was much more effective in achieving our goal of a Gasfield Free community. Importantly, there was no one expressing any view that Coal Seam Gas something we should have or needed. Our custom made “big sign” attracted a lot of attention, and there was much support from visitors who wished us every success and would be willing to help if there was ever a need to blockade or physically protest. 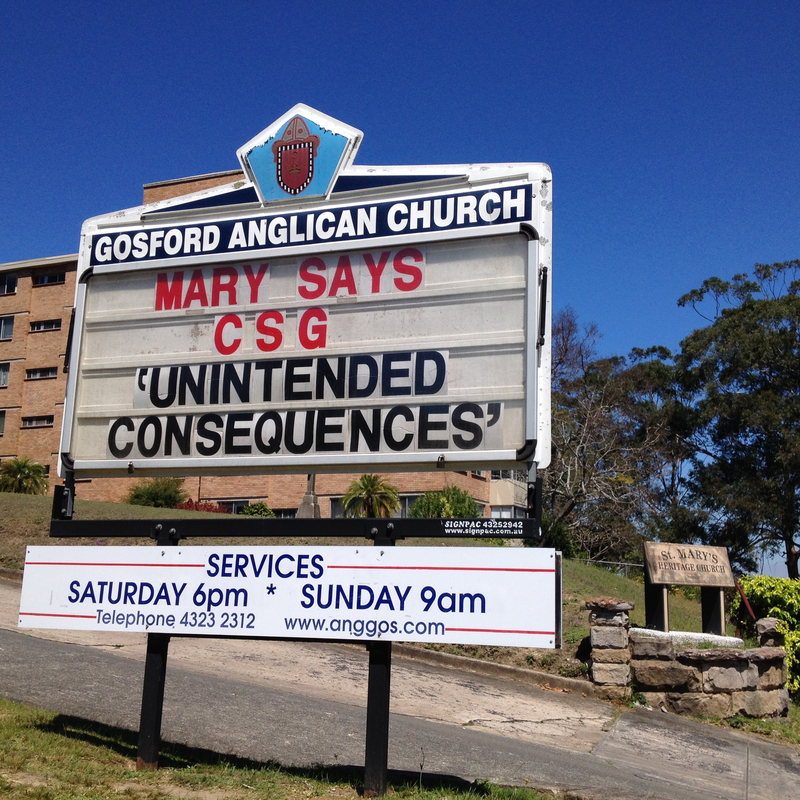 We emphasized that we are going to stop Coal Seam Gas before it came to that! Having a stall at our local market was another effective method of us achieving our goal and creating positive community connections. Thank you to everyone for your interest. My wife Marilyn Steiner and I moved onto 20 acres at Mangrove Mountain in 1999. We were attracted to this area by the rural lifestyle on a block with a stream running through it and lovely aspect. Over the past 15 years we have indulged our passion for gardening and have created a relaxing environment planting hundreds of trees, and in the process, creating a refuge for wildlife and over 80 species of birds. We were very disturbed to hear that coal seam gas mining could come to the Mountain. If it does, it will without a shadow of a doubt, destroy the fabric of this community forever. Pictures of sprawling mines, retention ponds and all the other infrastructure associated with this activity from other areas look like a giant spider’s web defacing the landscape. Our aquifers would be contaminated making the fresh water relied on by many for domestic and other uses unusable. And in case anyone thinks this is simply a problem for us to tackle, it will also impact on the catchment for the Gosford Town Water supply. From a personal point of view we have seen evidence of a woman in an affected area being notified that her home insurance would be cancelled if mining happened on her property. We are outraged that governments of all stripes are indulging destructive industries on several fronts at the expense of the communities they are elected and paid to serve, and will strongly oppose coal seam gas coming to this area and to other communities. My wife and I bought our first home together on 25 acres in Bucketty in 1997, and with our then 18 month old daughter moved in to a place of bush, koalas, wombats and quiet. We felt immediately that this is a special place; productive farms, clear and clean skies and water, and a richness of life in native forests. My own roots to this area go back further still, visiting friends who lived in a property then signposted as “Skye” just down from the crossroads on Wisemans Ferry Road. While we moved away for a time with work taking us overseas we kept hold of the Bucketty property, which became a home to a series of renters some of whom remain today in the district. During our time overseas we always took time when visiting Australia to spend time in the local area; until the draw of this place brought us back permanently about five years ago. From St. Albans Common to Bucketty to Kulnura, Mangrove Mountain to Peats Ridge and beyond and between there is much to love, appreciate and be proud of. During our time away it seemed on the surface that little had changed. Chicken sheds still lined the road, cattle and alpacas chewed grass, motorbikes still curled through the curves to Wollombi and most of the same people we knew then remained here still. We also found new friends and experiences that have become a special part of what makes this district a uniquely special one. As an example the Mangrove Mountain and Districts Country Fair has become a symbol to me of what this community can achieve when we pull together for everyone’s benefit. Meanwhile though the world continues to revolve and develop around us – the relentless push to dig, drill and pump for energy sources and raw materials has stepped up a notch or ten in pace and along the way communities all around the world have seen their way of life ridden over and cast aside. A community’s loss is seen as something that can be ignored as long as multinational mining and energy companies and their shareholders rake in profits, while politicians line their pockets and claim bragging rights about GDP growth come election time. We recognise that we live in a world that needs energy, and indeed our own lifestyle would not be possible without it. We do think though that there are many ways we can source the energy we need, with many of them being ways that our political and business “leaders” are clearly ignoring even as all-the-while they engage on a dash for gas, coal and oil. We think that there are many places that have an inherent value above and beyond the calorific and monetary value of what can be pulled from the ground. We think that water is more important than fuel; food more important than profit; family, friends and neighbours more important than shareholder value. We think that beauty, bush and communities are something that have a value exceeding the gross domestic profit of the country. I think that we get to live in the community we help to build. My family and I think that the industrialisation of our land, the permanent destruction of our water supplies, and the disruption to the communities throughout the Mountain District that coal seam gas extraction will cause are not acceptable outcomes for this district. We chose to live in this place, and we think that one of the measures of an individual is the willingness to say “No” when it is the right thing to do. These are the reasons why we will not accept coal seam gas extraction on our land, our neighbour’s land, or anywhere in our community. If we are NIMBYs then we are also NIYBYs too – not in my backyard and not wished in your backyard either. We think there is a better way – if you’re musically inclined this sums it up very well. Simon and Naomi Perry. Bucketty.